For SSL support a small server side script written in Python is required. You can also use Apache to serve js-remote. SSLserver.py will listen on port 8338 by default. Remember to use https:// instead of http://! Try it by opening https://localhost:8338/ in your browser. Uncompress zip/tarball and open index.html in your favourite browser. bitcoin: URIs allow for easy Bitcoin payments. You can encode a Bitcoin address, an amount, and optionally your name and a comment. 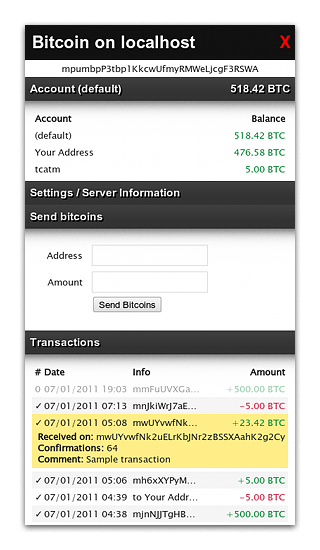 Transferring bitcoin: URIs to mobile devices is possible using QR codes. This generator creates QR codes and bitcoin: URIs using Googles Chart API.